Evaluations that are due and have been completed/submitted no longer display on the Evaluations screen. Administrators and faculty now have the option of choosing if sections that do not contain any activities should display on a selected vita. This prevents empty sections from displaying on vitas. In the Configuration section, click Vitae. The Vitae screen displays. Edit an existing vita template or add a new vita template. In the Show Empty Sections option, specify if empty sections should be visible on vitas created using the selected vita template. On the Faculty menu, click Vitas & Biosketches. The Vitas & Biosketches screen displays. Edit an existing vita or add a new vita. 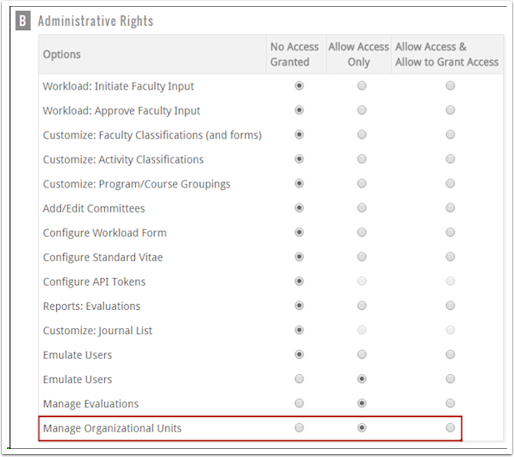 Administrators can now specify the type of access subunits can have to the organizational structure for managing organizational units. In the School section, click Organizational Structure. The Organizational Structure screen displays. Click the Edit icon for the desired subunit. The Edit Subunit screen displays.